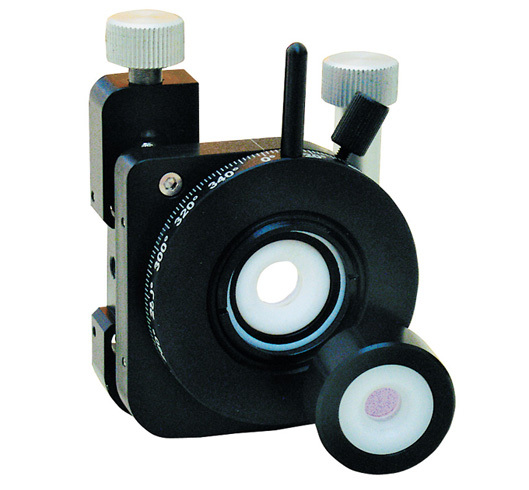 This kinematic mount is designed for ultrathin nonlinear crystal positioning. 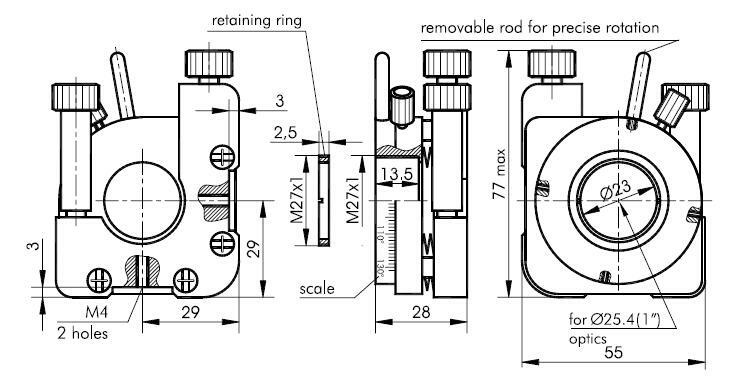 The mount accepts ring holders of Ø25.4 mm and thickness up to 10.5 mm. The housing is stopped by a rest-flange inside the central aperture of the platform, and is secured by a threaded retaining ring. The rotation position (X axis) is indicated on 360° angular scale with a gradation of 2°. The rotation platform has a removable rod that allows continuous 360° rotation without obscuring the aperture. This removable rod can be fitted into any of the four holes on the perimeter of rotation platform. Angular adjustment range of tilt/tip (X, Y axes) is ±2.5°. Two high resolution stainless steel vertical-drive screws with a pitch of 0.25 mm and “wedge and ball” mechanism ensure smooth and precise angular tilt/tip adjustment with 3 arcsec sensitivity. For tilting, the platform it is preloaded against the base with high quality springs. Large knobs on the adjusting screws relieve the strain on operator fingers during adjustment. Both screws protrude from the top allowing convenient adjustment outside the laser beam path & providing easy access for adjustments in densely packed optical set-ups. An extra M4 tapped hole on the side of the base allows you to operate the mount as a side-drive adjustment control mount. 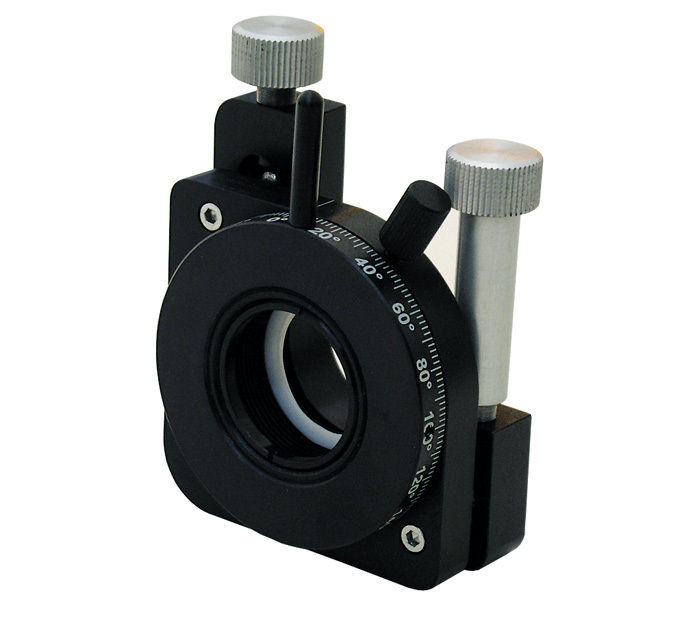 The mount is made of black anodized aluminum to help minimize reflections. A retaining ring M27x1, two Teflon rings and a tightening key to fix the crystal ring housing is included.